I was surprised the other day to talk to someone who thought it was cruel to make a dog jog with you. She ought to be at my house when my husband starts to get dressed to go jogging. The canine jogging addicts I live with go crazy. They spin through the house like whirling dervishes, whining in anticipation, both hoping to be the first to go. Age having its privileges, it is the custom in our house for the oldest dog to go first. So Sabre lunges out the door, biting at the leash in his anxiety to get started. Good heeling is a must for jogging, and it can be a challenge to teach a dog not to get excited and pull when you are running. Your dog has to understand that he cannot lunge after squirrels that cross your path or fight with dogs who might chase you. A prong collar often provides a good solution. Be careful if you are using a buckle collar that your dog cannot pull back out of it if he is startled. Since you are more visible than your dog, you will want to jog so that you are the one closest to the traffic. This means that if your dog is used to heeling on the left, you will have to jog facing traffic. Not all dogs like or should be jogging. A puppy should be at least eight months old before you begin, and older if he is a large, heavy-boned dog. Jogging is obviously not suitable for very small dogs. 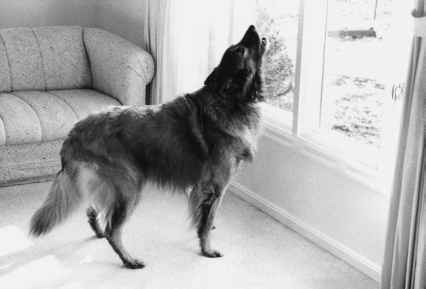 Dogs with hip dysplasia should jog only if a veterinarian has first been consulted. 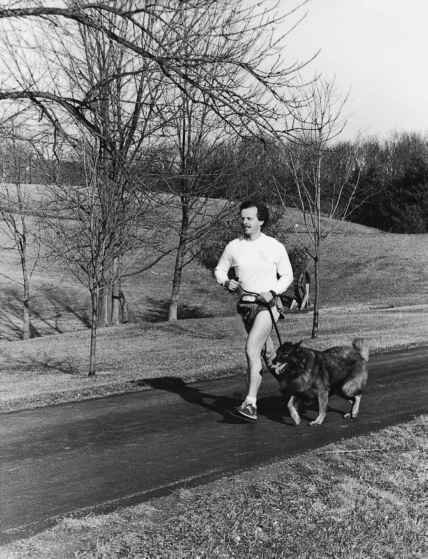 It may be that jogging moderate distances may build muscles that would help a dysplastic dog. If you have a breed prone to hip dysplasia, which includes most large breeds, avoid jogging if there is any sign of a limp or even a problem keeping up with you. Again, consult a veterinarian to be sure. Never force a dog to jog. How far you run with your dog is determined by your dog's and your condition. Two miles is probably a good distance, but even one mile of jogging can have a big effect on your dog's behavior. The maximum distance my husband has ever run with our dogs is 6.2 miles, the distance of a 10-kilometer race, which they sometimes do together. A dog must be over 1 year of age to do this kind of distance, and we advocate reducing the distance as the dog gets over 8 years old. Elderly dog jogging addicts can be a problem, as it is hard to explain to them that they are too old to continue jogging. We deal with the problem by taking our senior citizens over 10 years old on "pretend jogs." These are slow jogs of one-quarter to one-half mile to pacify the dog before leaving on the real run. The author's husband, Brad, jogging with his Belgian Tervuren, Sabre. As mentioned before, be careful about the heat when jogging. Increases in temperature decrease your dog's endurance faster than it does yours because his body does not cool as efficiently. He cannot sweat. When temperatures rise over 75 degrees, it is probably a good idea to leave your dog at home—even if that means you have to sneak out the door so that your canine jogging addict doesn't go berserk! Be careful also as your distances increase that the pads on your dog's feet are up to it, especially if you run on hard surfaces. This is true whether you are jogging or walking your dog. Dogs' pads vary in their toughness; check the pads often. Hot pavement can blister a dog's feet. The road can remain hot even after the air has cooled. The satisfaction some dogs derive from jogging transcends the exercise they receive. It is as if they have found the domestic equivalent of setting out on the hunt. A faraway look comes into their eyes; they ignore all distractions, intent on just covering ground. Dog and human become comrades in pursuit of their destination.